Heading to Florida for fall break. Catching up with a great friend and her new baby! We used to teach in Florida together, my first teaching job. Thought I'd update you on some more recent happenings in 2nd grade. We love using all the of the new Reading Wonders materials, and although you may think I am biased, I just love using the Reading Wonders resources that I've created! It's so nice to just pull them out every week. I've been trying to stay ahead of myself on them by having them printed, laminated, cut out and ready to go. It's amazing to think that next year they really will all be ready for me, no prep needed! What will I do then? Oh,I'm sure ill have other ideas that I will be excited to try out! Here is my vocabulary center area. 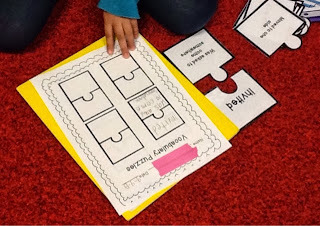 I have a vocabulary match, vocabulary puzzles, vocabulary maps, and a place on the pocket chart where students can work wait the vocabulary words. In my professional opinion, this center is great because it doesn't CHANGE!!! I don't have to research it each week. I just put the new words in, along with new copies of the a accountability sheets. Easy as that. 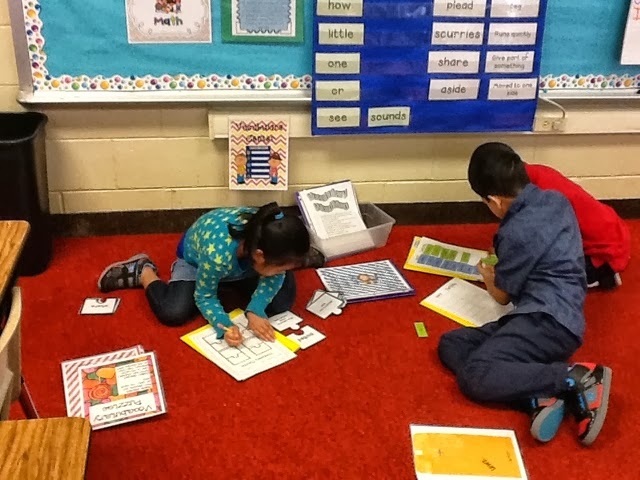 In my fluency center, I have two students listening to a leveled reading passage on cd, then practicing to read the passage fluently with a partner. While those two students (who are the same level) practice that, the other student practices fluency with my Super Reader Fluency Phrase cards. 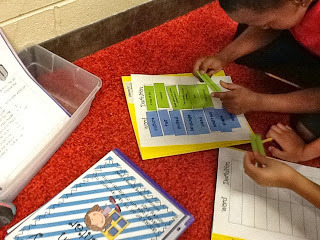 They love those and it's a good way to practice phrasing when it comes to fluency. Another thing that we have been working on a ton the past few weeks is how to write a response r literature/constructed response type of answer. 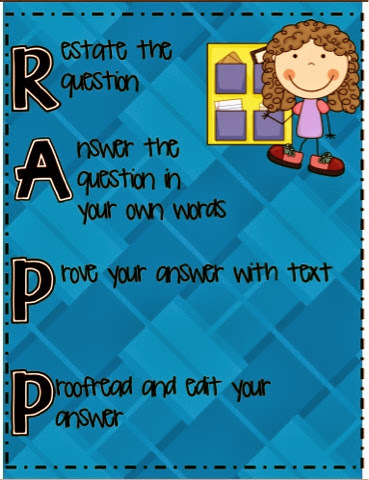 We use the RAPP strategy. We have been practicing hard and it has taken some time, but most of my students are finally starting to get there. We worked on it some during our unit test and I used a lot of explicit modeling to show them specific test taking skills, then practicing answering written response questions. The hardest part for my kids is starting out their answer, the restating the question part. It just really took them awhile to grasp what I was trying to tell them. 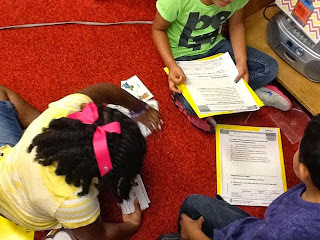 We are now doing at least one written response weekly in their small groups after reading the leveled readers and my higher kids are also doing one on their own during workstation/center time. Practice makes perfect! That's all for now, enjoying my time in Florida. Maybe more on the trip back!!! !